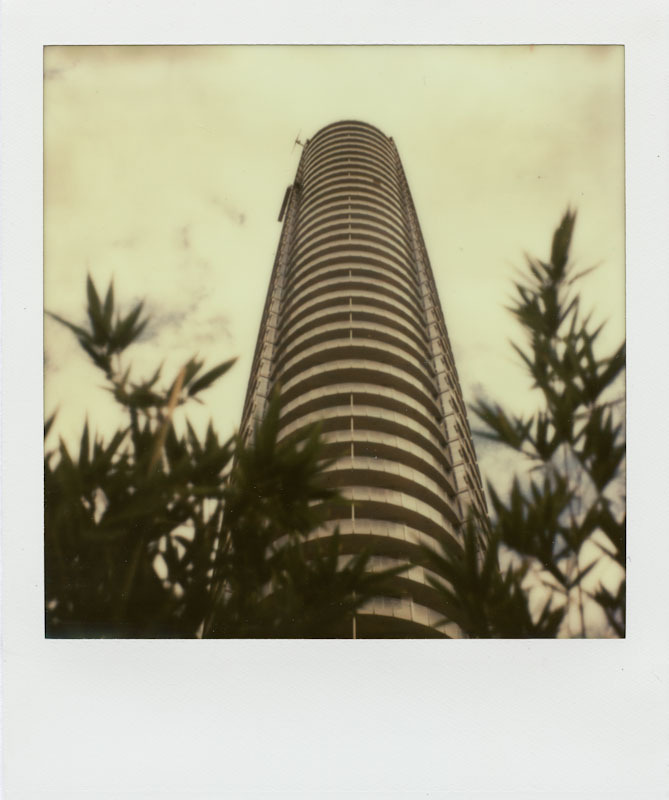 A new batch of test film via The Impossible Project! This particular batch is PX-70, optimized for use in SX-70 cameras. PX-70 is rated at 125 ASA, where as the PX-680 V4B I tested was rated about 640 ASA. For these tests, I’ll be shooting in various lighting scenarios; in the shade, overcast day, sunny day, indoors, using flash etc. 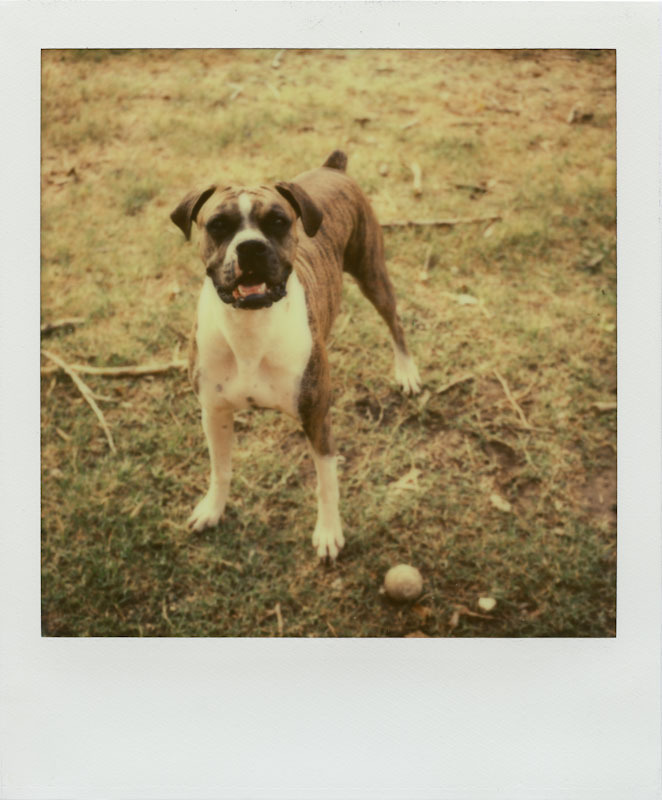 — The first image I shot was of our boxer, Maybelle. She’s been catching/chewing up sticks & tennis balls in the backyard lately. I shot this with a dark-slide protecting the image from direct light nearing sundown, however when I went back inside and removed the photo, I placed it right side up to develop. I’m guessing, but it looks as if the anti-opacification juice has been ‘upped’ a little bit. 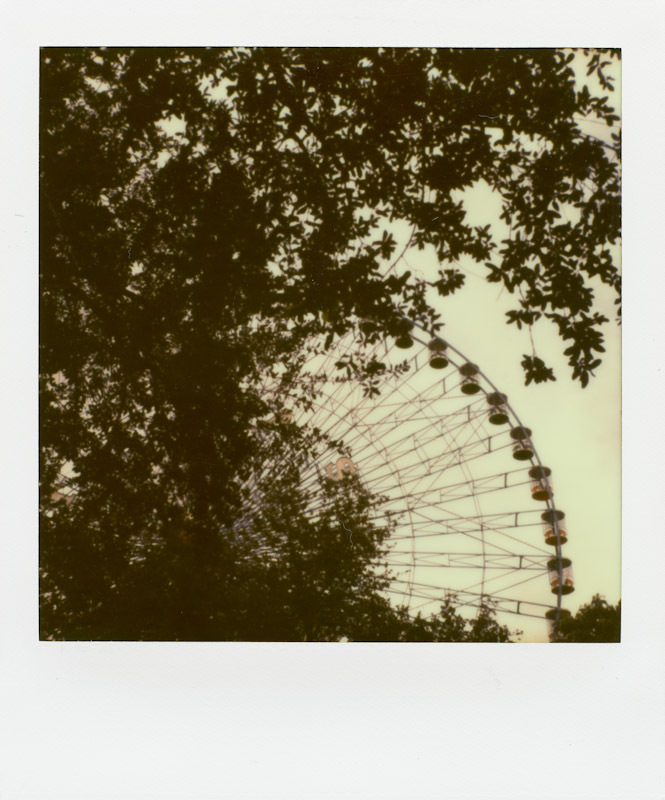 As stated on their website, this version of PX-70 does take 35-45 minutes to fully develop. Off the bat, A HUGE IMPROVEMENT over the PX680 I tested a few weeks ago. The colors that were in the scene are represented very well in this image. — My wife and I had a portrait shoot in downtown Dallas. While I was in the Arts District, I grabbed a quick photo of the new Museum Tower. When the newsletter came out for this particular test film, Impossible stated that you should “shield from direct sunlight, with little stress if the sun hits it shortly”. It was an overcast morning, and admittedly I was overcautious. I did shield this particular image and tucked it away in a box to develop. I cranked the exposure all the way down and fired away. I checked on it every minute or so for the first 15 minutes and then brought it out into the open light to watch it develop. — Fair Park: For the following, the image was taken with the exposure dial cranked all the way down and the image was ejected into the open in the shade. The image was exposed to ambient light for about 5-10 seconds, while I flipped it over and tucked it away in a box. There looks to be little difference in the sky, between the image shielded at the Museum Tower and the image of the Texas Star Ferris Wheel. — I had picked up some flowers for Synthia, so I decided to use them to test the color indoors. 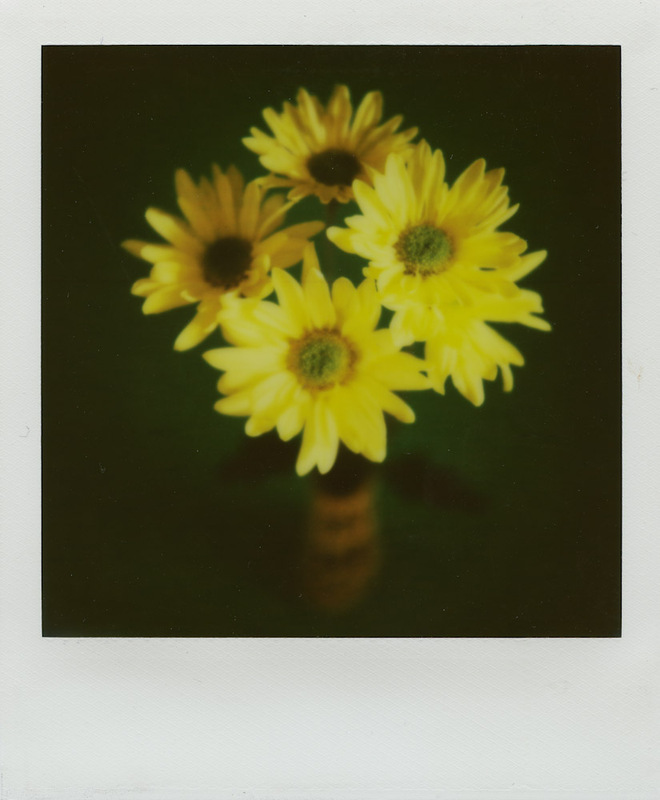 I set them near the window and cranked the exposure dial down 2/3’rds of the way on the SX-70. I’m weary of over-exposure; can you tell? For this image, it was shot near a window indoors, without being shielded, and was developed out in the open. To be honest, I would probably focus this a little differently if I had the chance to do it over. In my hurried state of excitement, I just let the autofocus go where it wanted to. — I went out later to a DART rail station by my house. The sun had just set, so I went ahead and shot the image, cranked 2/3’rds of the way down & unshielded. Once it ejected, I tucked it away in my bag. When I got back to my car (after maybe 2 minutes), I pulled the image out and drove back home. — Another image grabbed was at a Rangers game. The last time I went to one, I had shot some with a Spectra & some PZ680. 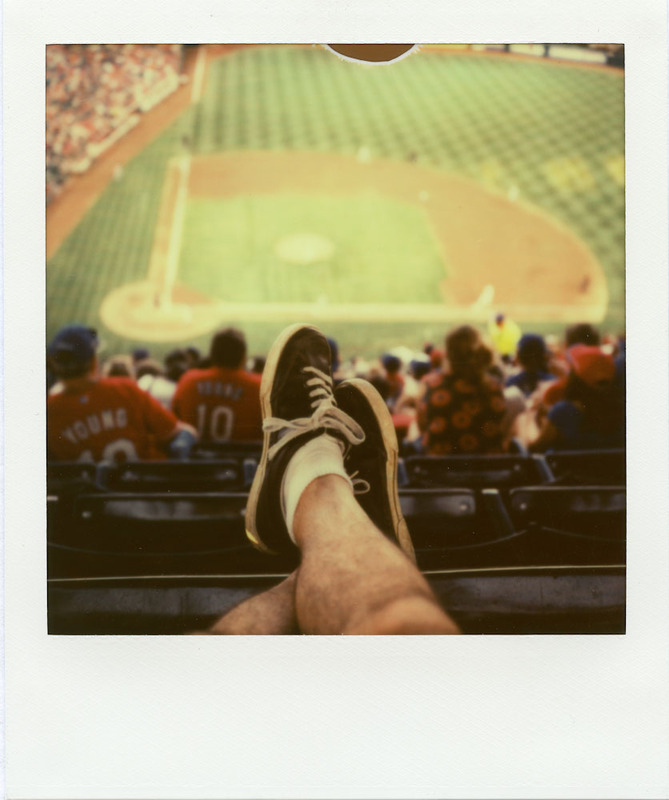 This time around, I was happy to have the SX-70 loaded up with this test film 🙂 We had tickets alllllllll the way up top and I snapped an image of the viewpoint. This was shot unshielded @ 2/3’rds dark and was tucked away into a box to develop seconds afterwards. Unfortunately, since it was an evening game, I didn’t get to shoot as much as I would have liked. The ambient light faded quickly and I decided to NOT test fate on iffy exposures. 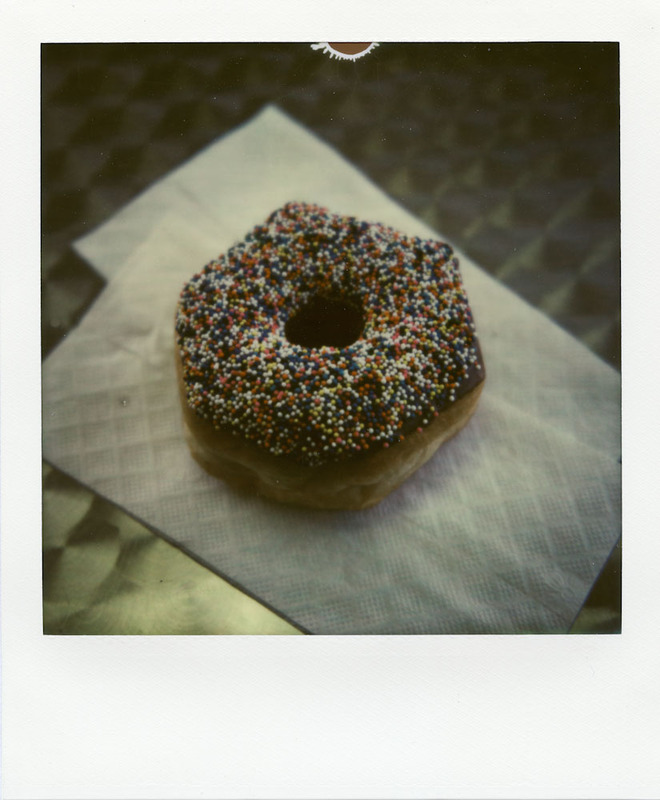 — I went up to Zak’s Donuts to snag a quick pic of a donut with sprinkles. It would be a good test of the film’s sharpness. I did the, now, normal routine of shooting it unshielded & tucked it away in the box. I shot this @ 2/3’rds dark, near a window. NOTE: As as I’ve also seen some state online, this particular batch of PX-70 film needs a little more exposure than what you’re used to giving it. I probably could have shot this at 1/2 – 1/3 dark and been OK.
— A quick shot of Synthia at the park. 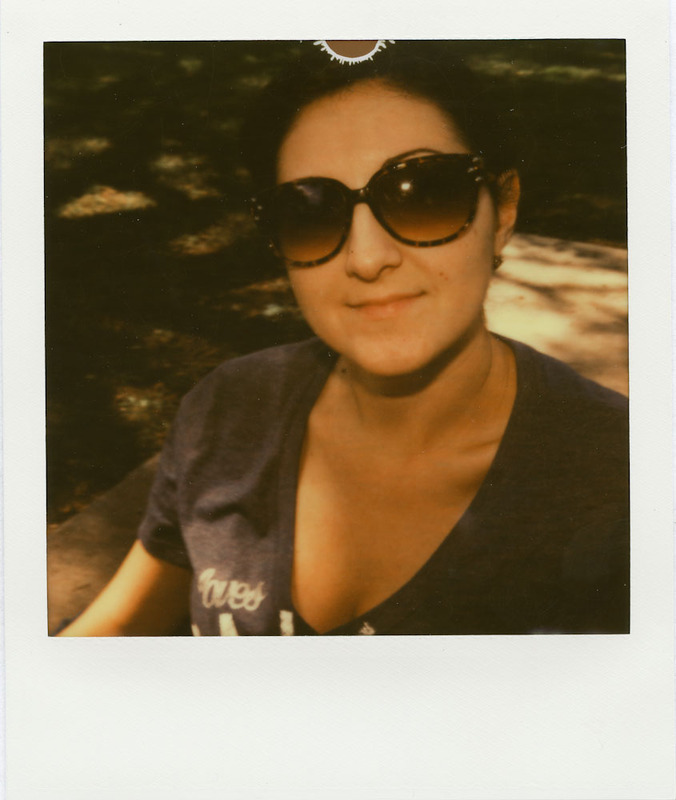 I used the Impossible flash bar by MINT @ 1/2 power and had the exposure dial set in the center. Shot unshielded and tucked away. It’s a little underexposed. I’ll try full power and maybe 1/3’rd dark next time around at this distance. — We ate at the Crazy Horse Saloon in Rockwall, TX. I snagged this photo just outside the restaurant/bar that’s located in the marina. Synthia suggested to shoot it upside-down. It was a little tricky but not too bad. This image was shot 2/3’rds dark and unshielded. If you’ve never shot Impossible Film before, NOW IS THE TIME to get on the wagon. Word on the street is that these versions of their films will be available THIS FALL. Think about it. Pick yourself up any type of Polaroid 600, Spectra, or SX-70 and you’ll be set! Because the newer batches of film aren’t as sensitive to light, all you have to do is tuck the image away within a few seconds to develop, OR if you’re indoors, you can watch it develop! Up until this point, the images have needed a high level of protection in order to keep them safe from ambient light when the initial stages of development had begun. Shielding the film has been a necessity. Very quickly, that level of protection is becoming less & less needed. Excellent Justin! 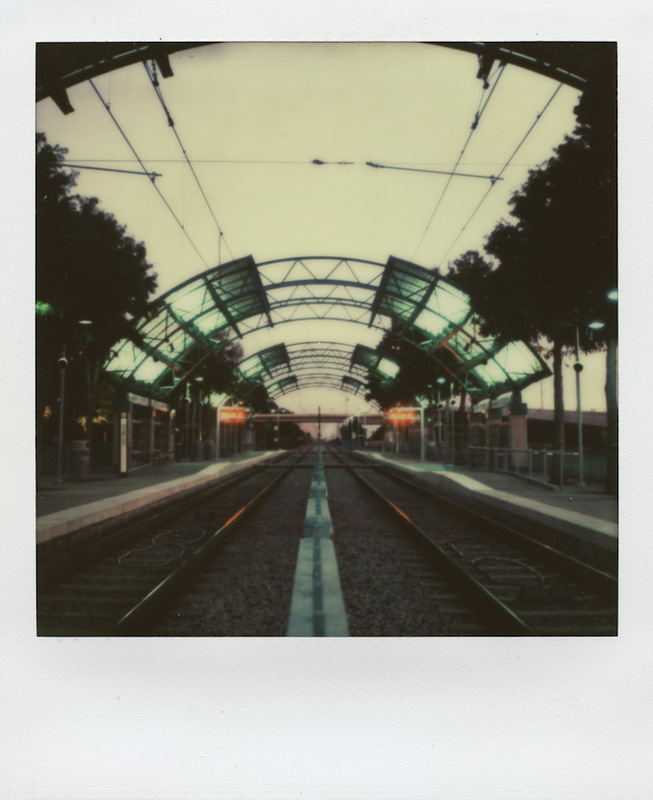 We just moved to Dallas from Tokyo and you are showing that there are plenty of photo ops in this town for the SX-70. Your shots are really quite nice and I particularly enjoy the reflection shot. I’ll likely get some Silver Shade in the near future to try out my SX-70 here as well. I’ve also got a Spectra that is a favorite of mine. For now I’ll stick with my Mamiya and 120 film. Thank you Mark! Dallas is quite the change from Tokyo! There are some picturesque locations around the metroplex. You just have to hunt for them a little bit. I’m going to organize a PolaWalk one day during the State Fair. Hopefully you can join us! That sounds pretty cool. 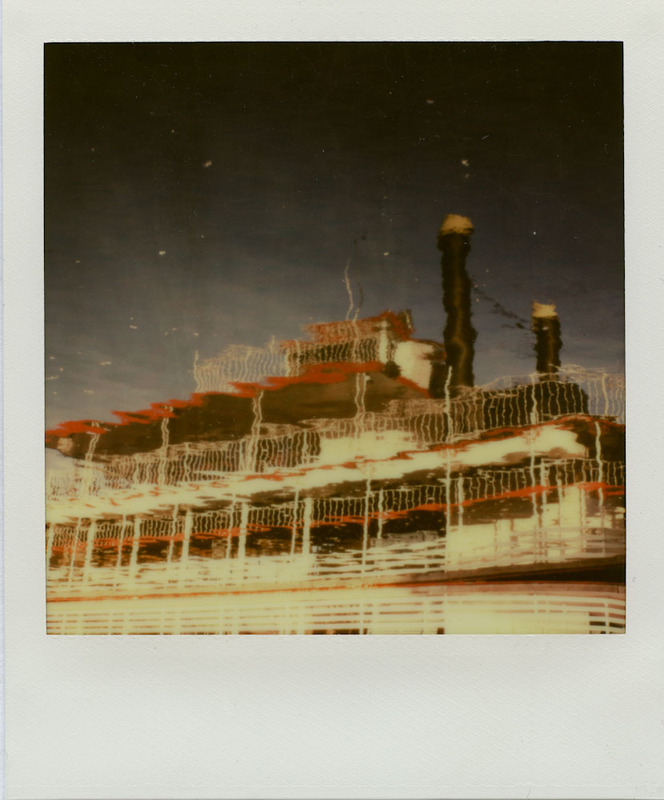 I’ve used up the last of my original Polaroid film so I’d have to order some from Impossible. Wow, those are excellent! I particularly love the flowers and the baseball game — so much color.. I can’t wait to try this film. Thank you Deirdre! I look forward to seeing what you do with it! TIP said they are aiming for a late September release date. 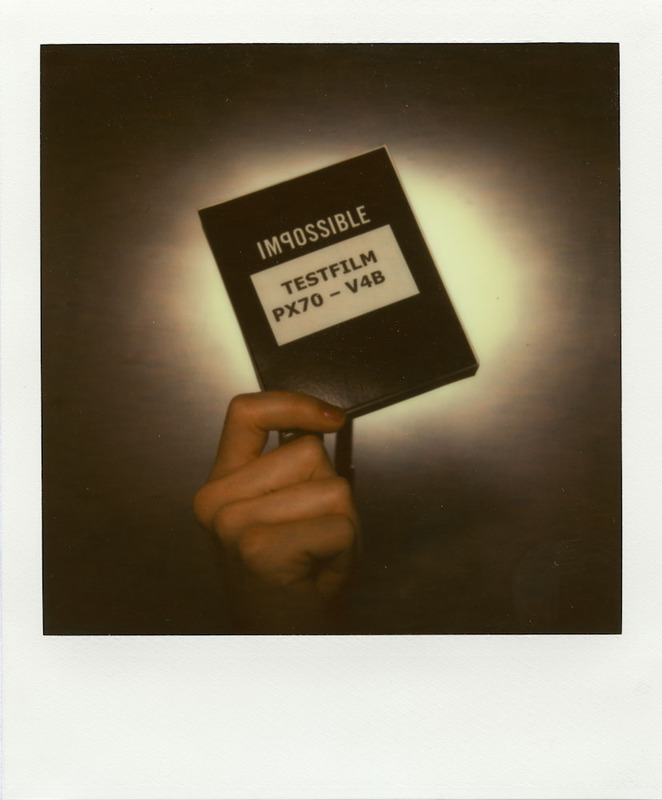 You are currently reading Impossible Project PX-70 V4B Opacification Test Film at Justin Goode.